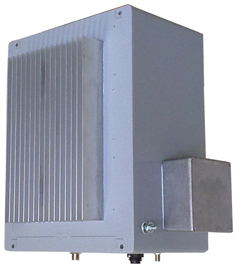 TV frequency relay transmitter 2.2 - 2.7 GHz 0.2 W The TV frequency relay transmitter is a device that allows the reception of a TV signal in places where the coverage from the main transmitter is insufficient due to the geographic or urban ruggedness of the terrain. It is also designed for point-to-point transmission of a TV signal, so it is possible to use it as a “relay link” for the transmission of a signal to inaccessible places, e.g. for cable TV. The relay transmitter has a certificate. MMDS Repeaters: 2W; 10W; 20W. The MMDS repeater is used for the signal covering of places where an MMDS signal is weak or is of a low quality. The repeater amplifies the received signal and, after changing the polarization through a transmission antenna, it transmits the signal further. Thus the signal can get to places where the reception was limited or impossible. The built-in panel meter allows a quick check of the repeater with a measurement point switch. MMDS outdoor transmitters: 10W, 20W . The MMDS transmitter with pasive cooling mounted on the mast.